There's a nip in the air. Outside it's beginning to snow, the first fall of winter. A few delicate flakes tumble from the sky, innocently enough, but this is no mere flurry. Soon the air is choked with snow, falling so fast and hard it seems to pull the sky down with it. Indeed, that's what happens. Weeks later when the storm finally ends the entire atmosphere is gone. Every molecule of air on your planet has frozen and fallen to the ground. That was a snowstorm-on Pluto. (-240 C), these molecules crystallize and the atmosphere comes down. "The collapse can happen quite suddenly," says Alan Stern of the Southwest Research Institute. "Snow begins to fall, the surface reflects more sunlight, forcing quicker cooling, accelerating the snowfall. It can all be over in a few weeks or months." Researchers believe this will happen sometime during the next 10 to 20 years. Pluto is receding from the warmth of the Sun, carried outward by its 25% elliptical orbit. Winter is coming. So is New Horizons. Stern is lead scientist for the robotic probe, which left Earth in January bound for Pluto. In 2015 New Horizons will become the first spacecraft to visit that distant planet. The question is, will it arrive before the snowstorm? "We hope so," says Stern. The spacecraft is bristling with instruments designed to study Pluto's atmosphere and surface. "But we can't study the atmosphere if it's not there." Furthermore, a layer of snow on the ground ("probably a few centimeters deep," estimates Stern) could hide the underlying surface from New Horizon's remote sensors. Stern isn't too concerned: "Pluto's atmosphere was discovered in 1988 when astronomers watched the planet pass in front of a distant star-a stellar occultation." The star, instead of vanishing abruptly at Pluto's solid edge, faded slowly. Pluto was "fuzzy;" it had air. "Similar occultations observed since then (most recently in 2002) reveal no sign of [impending] collapse," says Stern. On the contrary, the atmosphere appears to be expanding, puffed up by lingering heat from Pluto's waning summer. Nevertheless, it's a good thing New Horizons is fast, hurtling toward Pluto at 30,000 mph. Winter. New Horizons. Only one can be first. The race is on..
Find out more about the New Horizons mission at http://pluto.jhuapl.edu . 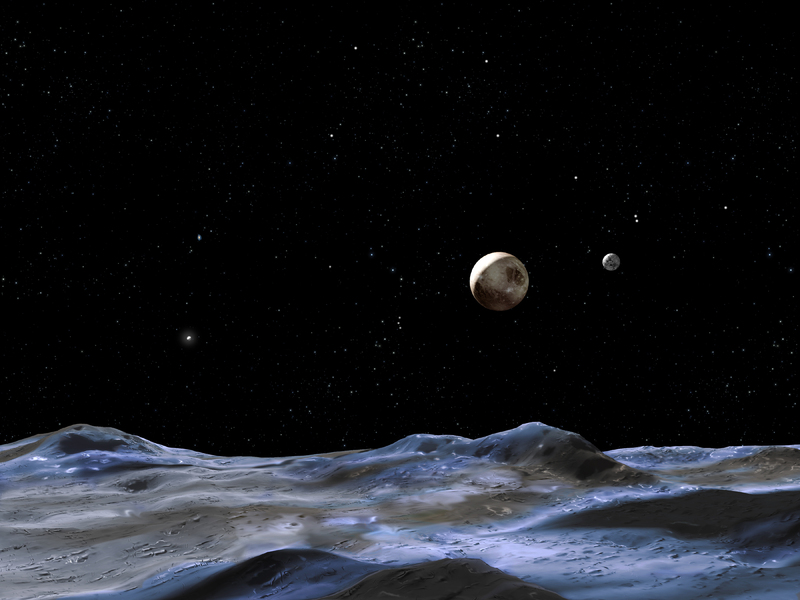 Kids can learn amazing facts about Pluto at spaceplace.nasa.gov/en/kids/pluto.